Guayaquil is one of the most intriguing and diverse cities in Ecuador—a country already known for its diversity of climates, people, and lifestyles. It certainly is the biggest; the metro area spreads out over almost 1,000 square miles, and is home to 3 million people. With growing satellite communities like Durán in the east, and neighborhoods springing up along Route 40 to the west, it is estimated that as many as one out of every five Ecuadorians live within an hour of downtown Guayaquil. Like most major cities, Guayaquil’s importance is based on geography. The city center is on the west bank of the Guayas river, which provides a protected, smooth, navigable channel to the Pacific Ocean, about 40 miles to the south. This is why Guayaquil is called “The Pearl of the Pacific”, even though technically it is a riverfront town. Guayaquil is the most important port city in the country, with most of the goods both exported and imported passing through its docks. With a busy international airport and major roads leading to all parts of Ecuador, it is a natural center for not just shipping, but for manufacturing and other business enterprises as well. Even the most novice traveler will notice very quickly that Guayaquil is not exactly a planned city. Due to its rapid growth, especially over the last 40 years, the metro area has expanded faster than city planners can control. Growth of business and increases in port traffic has brought a steady stream of people from all parts of the country, looking for work and erecting structures to live wherever they could find some space. Although you do see some planned communities, especially in the affluent section of Samborondon, the vast sprawl of homes on the hills surrounding the city center and lining the riverbanks accounts for much of the population. This can make getting around in Guayaquil an exciting and confusing proposition. Cabs are plentiful and very affordable (most trips around town will run from $3 to $5), and recently Uber and Cabify have also been adding drivers. But don’t be surprised if your ride starts out heading away from your destination, or if you notice you just passed it on the opposite side of the highway. The complex street system and the number of one-way roads mean you sometimes must circumnavigate to get where you are going. 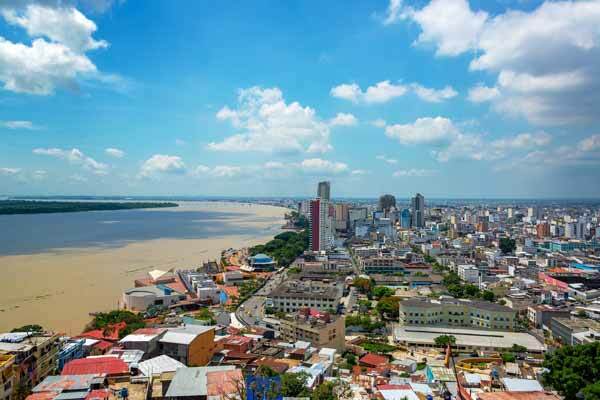 Despite its size—or maybe because of it—Guayaquil is an active, vibrant city with plenty of things to see and do, a great variety of restaurants and shopping, and some beautiful parks and architecture. 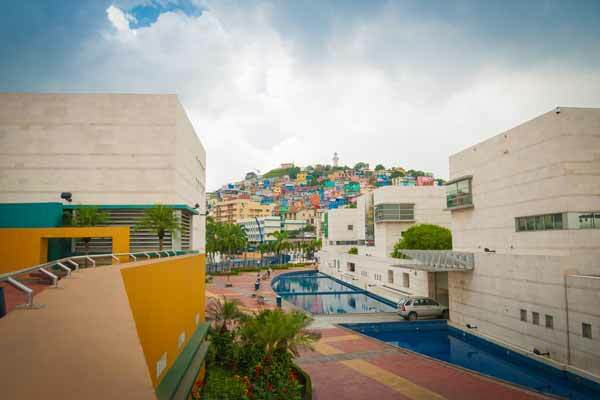 Currently, there are only a handful of North American expats who call Guayaquil home. Most who want to live in a city choose Manta on the coast, or between Quito and Cuenca in the Sierras. Many potential expats find Guayaquil to be a little too big, too much traffic, and a little too active. North Americans in Guayaquil are mostly made up of people like exchange students, volunteers for charity organizations, employees of a multi-national company or an embassy, or someone who is married to an Ecuadorian. However, for the thousands of expats who live along the southern coast, Guayaquil is a wonderful resource. It is the place to find whatever household goods you may need, major and small appliances, and top-notch medical care. It is also great when you just need a “big city break”, and want to enjoy the variety or restaurants, museums, and other tourist attractions. Guayaquil is also where you can go to get anything official taken care of. Things like renewing or filing for cedulas (national identity card), immigration issues, legal services, drivers’ licenses, business permits, and so on. All of the major healthcare insurance providers also have offices there. Let’s take a look at some of the other things you can find in this city on the Guayas. There are some terrific tourist destinations in Guayaquil. Here are just a few examples. 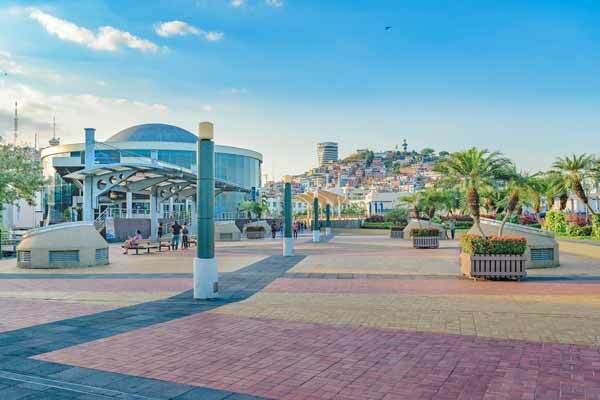 Stretching a mile and a half along the west bank of the Guayas River, the Malecón 2000 walkway is a great place to visit in Guayaquil. It is roughly in three sections—the south section, which is mostly restaurants and shops; the central, where you find monuments like the Civic Plaza, Moorish Clock Tower, and the Rotunda (the Yacht Club and Naval Yacht Club are here as well); and the north section, which is home to two museums, an IMAX theater, a planetarium, an antique train, plenty of fountains and recreation areas, and the new giant Ferris wheel. There is at least a dozen play and recreation areas, and many shady places to sit and relax. The Malecón hosts frequent special displays and events like concerts and a Christmas Garden, and often there are naval ships or beautiful three-mast sailing ships docked and allowing tours. This is also the embarkation point for scenic tours up and down the river, which is particularly lovely in the evenings. Just north of the Malecón is the historic barrio of Las Peñas. 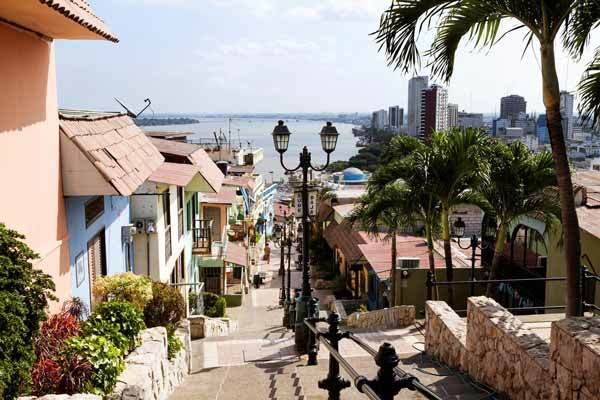 More than 400 years old, Las Peñas was the first neighborhood of Guayaquil. In 1982 the neighborhood was declared Cultural Heritage of Ecuador and between 2002 and 2008, the place was restored and regenerated by the Municipality of Guayaquil. This neighborhood, born in colonial times, has been rebuilt after fires, while trying to maintain its colonial style. Visitors enjoy walking its cobbled street, which winds mostly uphill between bright pastel-colored homes and business. There are several art museums and souvenir shops, and several restaurants with terrific views of the river. Eleven presidents of the country lived in this neighborhood, as well as historians, artists, and musician Antonio Neumane, author of the lyrics of the national anthem. It is also said that the revolutionary Che Guevara lived there for a while, giving free pediatric assistance to the inhabitants of the place, and that the neighborhood was visited by American writer Ernest Hemingway and Chilean poet Neftali Reyes, better known as Pablo Neruda. As long as you are in Las Peñas, and your knees are up to it, you should visit the blue and white striped lighthouse and small church at the top of Santa Ana hill. There are 444 steps to climb, so it is not for the faint of heart, but once there, the view from the top of the small lighthouse is spectacular. It is no wonder this was one of the first places settled in Guayaquil; it is a highly defensible position, and a lookout point that guarantees no one can sneak up on you from the river or the hills. The walk up is its own reward, with colorful buildings and shops to delight the eye, and historical displays that give you a good excuse to stop and catch your breath. This is the lovely park square in front of the Metropolitan Cathedral of Guayaquil. The church is an impressive example of neo-gothic architecture, with two towers and large, sweeping arches in the stunning interior—well worth a visit. But as attractive as the Cathedral is, most people know the square in front as Iguana Park. Like many squares in South America, Parque Seminario has fountains, flowerbeds, and sculptures. In this case, a statue of Simon Bolivar on horseback dominates the center of the park. But that is not the big attraction either. Tourists and local residents alike come to the park to feed and watch the iguanas. About 200 of the large, green reptiles make their home in the park, ranging in size from just a few inches up to three or four feet long. One corner of the park has a rocky water park filled with turtles that provides water for the iguanas, and there are plenty of trees for them to climb. Food is no problem, as visitors love to feed them lettuce, cabbage, and pieces of fruit. On the peninsula that contains the upscale community of Samborondon, there is a real gem of a tourist destination. Started in 1997, this is a unique place that offers glimpses into the history of the city and region, along with a zoo and other attractions. Visitors can get a taste of the old days in which the people of the old province of Guayaquil used to develop their resources, such as the woods, the countryside, and the city. 1) Wildlife Area: Approximately 10 acres are set aside to recreate the natural habitat of more than 50 species of birds, mammals, and other animals that are found in the Guayas province, some of which are in danger of extinction. Parrots, harpy eagles, toucans, and ducks live here along with sloths, ocelots, deer, spider monkeys, and plenty of reptiles. The wildlife area is toured through an elevated trail with two-dozen themed stops to admire each species individually. Flora of the region is also represented, as the trail winds among several varieties of mangroves and other trees, plants, and flowers. 2) Urban Architecture Area: Here you see a recreation of the wealthy times of Guayaquil in the first decades of the 20th century, when the city enjoyed an economic boom thanks to the growth and exportation of cocoa, still an important crop in Ecuador. Live theatrical performances take place on weekends, presenting actors dressed in French style clothes, which were very fashionable at the time. There are also exhibits of the turn of the century architecture of Guayaquil. Many famous houses were rescued as Cultural Heritage for tourist to learn about the urban life of the Guayaquil of old. There are also museums, restaurants, and coffee shops. 3) Traditional Area: This section of the park is dedicated to preserving the memory of both urban Guayaquil and other areas of Ecuador. You can follow the process of making chocolate from the fields to the factories, learn about the many different plants, produce, and orchids of various parts of Ecuador, and get a deeper appreciation of the different peoples and customs. As you might expect from such a big port city, there are plenty of places to shop in Guayaquil. There are at least seven major indoor malls; Mall de Sol, Policentro, San Marino, El Fortin, City Mall, Rio Centro Norte, and Rio Centro Los Ceibos. North American shoppers will feel right at home here, as there are many popular U.S. stores in these malls. All of them have food courts and restaurants, and most have movie theaters and major household or grocery stores. There are countless smaller strip malls and retailors of all types to be found in the city. For the more adventurous shopper there are also large, open-air markets scattered about town selling anything and everything. One of the largest is near the south end of the Malecón 2000, and covers several city blocks. Everything is cash only, there are no receipts, and all prices are negotiable. Just because it is a big city, it doesn’t mean you can’t find souvenirs of the countryside. There is also a large Artisanal Mall that has authentic crafts, art, textiles, and more from the northern and southern Andes, as well as from the coastal regions. Guayaquil has some of the best medical facilities in Ecuador. Two major hospital systems in particular are very popular with expats and Ecuadorians for their excellent equipment, well-trained multi-lingual doctors, and affordable prices. The Grupo Hospitalario Kennedy, more commonly called the Kennedy Clinica, has three major health centers in Guayaquil, and doctors in all specialties on staff. They have full diagnostic centers as well including things like x-rays, sonograms, and MRI scans. The Omni Hospital is also a very fine medical center in the heart of the city. And of course, there are thousands of smaller clinics, dental centers, labs, and other health resources in town. This is where you find the best in private care, but there are also many IESS (the state-run health care service) centers as well. In fact, one of the largest and newest in Ecuador was recently opened in the Los Ceibos area. There you have it, a brief look at just a few of the things that make Guayaquil such a great paces to visit, and a terrific resource for expats and Ecuadorians.